The Anaheim Ducks have, by and large, been blessed when it comes to National Hockey League expansion teams. Stars like Paul Kariya and Teemu Selanne graced their roster – then composed of Mighty Ducks – early on in their existence. They made two Stanley Cup finals in four seasons, taking the New Jersey Devils to seven games in 2003 before winning it all in 2007, at the expense of the Ottawa Senators. Despite having never again reached the precipice, the Ducks have been one of the most dominant teams in the Western Conference, lo these many years. However, despite this history of on-ice success, they’ve never quite figured out the uniform side of things. It all began with a colour scheme that resembled an Oompa Loompa’s vomit. Jade and eggplant were the dominant colours, strange choices for an NHL team, to be sure. And yet, when combined, they’re really rather endearing. The aggressive-looking, disembodied, duck-shaped-goalie-mask-flanked-by-two-sticks logo also isn’t bad, and has become a favourite of hockey fans the world over. 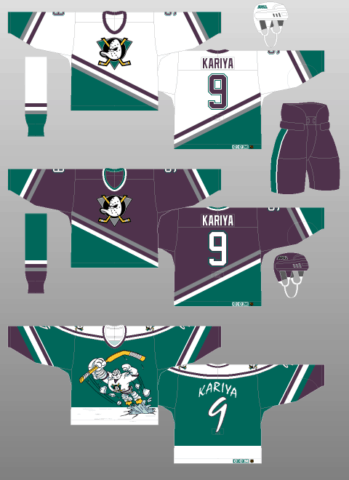 This initial jersey design retained enough of the cartoonishness of the team’s inspiration – the 1992 film, “The Mighty Ducks,” but was also the appropriate amount of aggressive for a professional hockey team. On a more technical note, the jersey’s novel diagonal striping was simple and well-done, even if the jersey numbers did overlap with the tail package. So, though the design and colour scheme was most definitely unusual, the Mighty Ducks didn’t go overboard with the zaniness; the novelty doesn’t feel forced. However, during their third season, the infamous “Wild Wing” jersey (guess which one that is) made its debut. How they could expect grown adults to skate out in front of thousands of people wearing that – not to mention compete against another team of grown adults – is completely beyond me. As you can see, the diagonal striping of the standard uniform set has been retained for the sleeves, but has been made unnecessarily complicated and disjointed by alterations to the spacing and thickness. Adding to the confusion is the lack of continuity between the sleeve striping and that of the tail, which just features a single thick, white block. Meanwhile, the best part of this sweater – the beautiful jade background – is rudely interrupted by the stark-white, retina-piercing shoulder yokes. While we’re on the topic of the jersey body, can someone tell me how on Earth the cartoonish typeface used for the letters and numbering passed accessibility standards? Even worse, this was in the days before high-definition television! But, who are we kidding, the worst part of this kit is the “Wild Wing” logo. A complex creation made possible by new printing techniques, the cartoon duck exploding up through the “ice” of the tail striping makes for an absolutely ridiculous scene. The Mighty Ducks already faced an uphill battle for NHL respect, given that they were owned by the Walt Disney Company and named after a minor hockey team from a children’s movie. The release of this sweater only confirmed all the smug dismissiveness of the hockey establishment towards the fledgling Anaheim franchise. 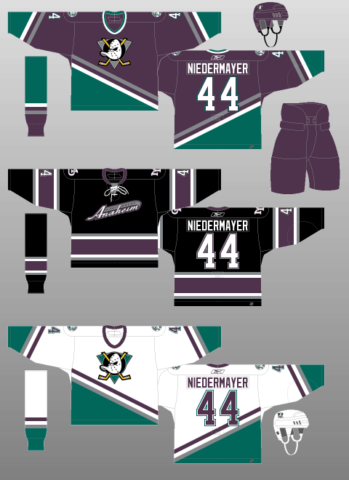 That all said, for three glorious seasons, 1997-98 through 1999-2000, the Mighty Ducks had alternate jerseys to be proud of. They aren’t the best-looking kits, to be sure; the jade one in particular only lasted two of the three seasons mentioned. But they aren’t exactly offensive, either. Both feature full-length shoulder yokes made up of four different colours (jade, eggplant, silver and yellow – a trim colour likely added to complement the colour of the hockey sticks on the primary crest), along with a different (less generic and overall better, in my opinion) typeface for the names and numbers. Unique socks for these new alternates were rolled out for 1998-99, the year pictured above. Interestingly, for 1997-98 and 1998-99, the Mighty Ducks switched to black pants and helmets (the latter worn with the dark kits only), a change which really looks rather good, lending aggressiveness and grounding the more unusual shades present in the Anaheim colour scheme. The Mighty Ducks would revert back to their original eggplant helmets and pants in 1999-2000, however. 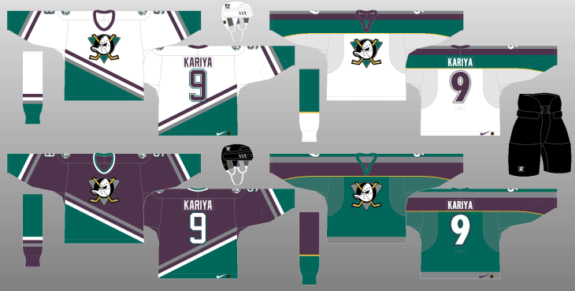 Given there were two separate third jerseys, one white and one dark, it’s reasonable to speculate the Mighty Ducks might have been testing the waters regarding potentially replacing their standard home and away kits. Obviously, the experiment ended in favour of the originals, with the jade alternate eliminated ahead of the 1999-2000 campaign and the white done away with the following year. And that’s a shame, as the white alternate in particular shows real promise. I’m not a fan of the excessive striping on either sweater (especially the silver – it darkens and dampens an already dim colour palette), and the sock pattern is too blocky for my taste, but there’s something there in the overall general design. As simple, more traditional complements to the Mighty Ducks’ weird and wonderful home and away uniforms, these third jerseys were the right design at the right time, and, with some tweaks, would have looked truly magnificent. 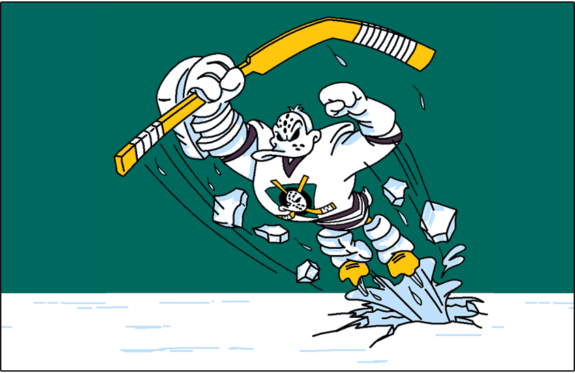 In 2003-04, the Mighty Ducks sought to do away with their cartoonish past by adding a more menacing third jersey to their aesthetic arsenal. Now, I’m not totally against the idea of black jerseys, even for teams for whom black is not a component of their colour scheme. However, the execution of this particular example is excruciatingly poor. First of all, where’s the jade? Black is already a hard-enough colour to work with as a jersey base, so keeping the dark eggplant and silver shades, and eliminating the brighter jade, just makes this kit utterly dull and dreary. Secondly, text-based logos are generally a bad idea for hockey jerseys, but especially so when it comes to Anaheim, a franchise with one of the most recognisable and universally adored logos in sports. In its place, a handwriting-like script reads “Anaheim,” and is topped with a “MIGHTY DUCKS” wordmark. The shoulder patch is even worse, composed of nothing but an overlapping “MD.” Real inspirational. The Mighty Ducks tried to do something fresh, new and exciting for their third sweater. Instead, they ended up with a kit that is not only depressing, but downright boring – the worst possible quality an NHL jersey can have. Needless to say, the Mighty Ducks’ first attempt at changing their image did not last long. After the 2005-06 season, the Mighty Ducks became just the “Ducks,” and their desire to break with their past carried over to their uniforms. For 2006-07, the Ducks debuted a totally new uniform suite, which featured a heavy emphasis on black, to along with gold and orange accents. These uniforms won’t be winning any awards for their aesthetics, but the Ducks won the Stanley Cup their very first year of use, so who am I to argue? 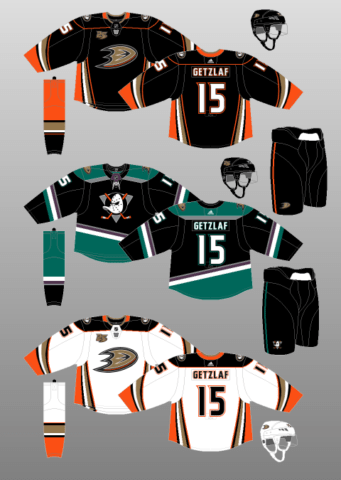 But argue I shall, with the contention that, though much improved over Anaheim’s initial attempt at a black kit, the Ducks’ jerseys are still just a little bit boring. The swooping, five-component striping that adorns the sleeves and tail of both the home and away uniforms is a modern take (though reversed in orientation) on the Ducks’ historically diagonal striping. That’s a nice touch. There’s certainly no problem with being taken seriously, either; the heavy use of black in the jerseys, pants and socks, to go along with the subtly dangerous – yet still duck-like – names and numbers, makes for an undeniably aggressive look. However, again, the logo is the problem. An “ANAHEIM DUCKS” wordmark, even if the “D” is styled to look like a duck’s foot (or a duck in flight? ), just isn’t cutting it. All the snarl and ferocity built up by the colour palette and sweater template simply evaporates around this disappointing attempt at a logo. I also feel other colours besides black and white could have been used for the bodies of the numbers to sharpen things up a bit. Or perhaps the gold trim could have been replaced with orange. Anything to give these kits a little more punch. 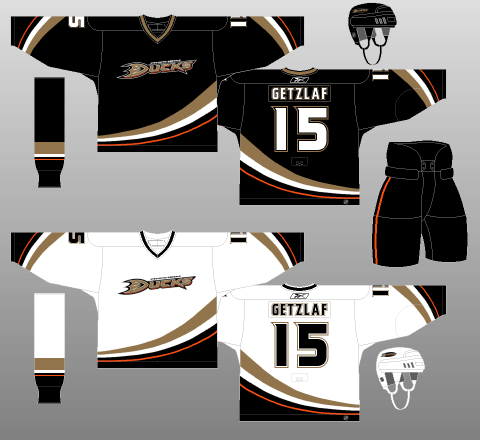 For 2014-15, the Ducks made the alternate kit they wore from 2010-11 through 2013-14 their full-time home uniform, creating a white edition of said template for the road. An orange third jersey was added in 2015-16. This time, I have to say, I really think they’ve got it right, at least in the context of the Reebok Edge uniform system. I’ve never been a huge fan of Reebok Edge and the corresponding cacophony of often-ruinous alterations made to team kits, specifically with regards to Edge’s weird, unnatural fascination with vertical striping (Colorado Avalanche, anyone?). That said, if there’s one jersey set on which it totally works, it’s that of the Ducks. The sweeping, diagonal tail striping used on both their original and Cup-winning jerseys remains, but has been turned on its side and bolstered by orange (the sleeve striping remains unaltered). Obviously, horizontal striping would be preferable but, in the context of what was going on in the NHL at the time, this is as good as it gets. Lots of colour, no random piping (though the tracing around the shoulders can probably go) and no perpendicular intersections. Everything flows together to create something that, by and large, works wonderfully. Perhaps most notably, orange has been used as a major component of the colour scheme, rather than just an accent, on both the jerseys and socks. Anaheim’s jerseys were brightened considerably, perfectly balancing the darkness of the rest of the kits. Even the (duck foot? duck in flight? maybe both?) logo is a marked improvement over the rather dull “Ducks” which graced the Cup-winning design (although the shoulder patch features the Ducks’ original logo, so they probably just should have used that). Anaheim stuck with the same typeface for the numbers and lettering, too, which utilises enough flourishes to be interesting, while still retaining legibility and professionalism. Just ducky. 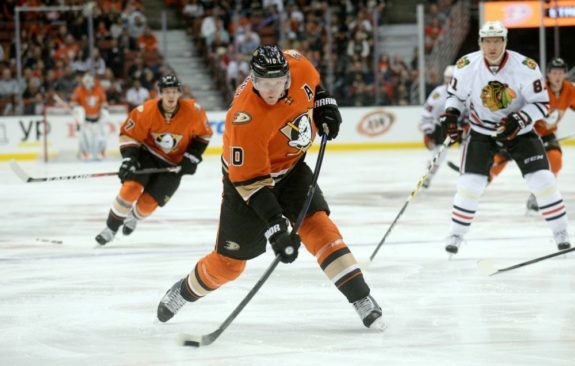 That these complex jerseys are perfectly contrasted with the plain black pants – save for a single, thin orange stripe separating the orange of the sweaters and socks, only strengthens my conviction that Anaheim has one of the more balanced, sharp-looking Reebok Edge uniform sets in the NHL, one which has carried over into the ADIZERO era. My only real qualms are that the main logo would function better as a secondary emblem, and that the shoulder patch looks half-baked and thoroughly out of place. Oh, and that fake neck-tie reminds me of Hannibal Lecter’s mask. 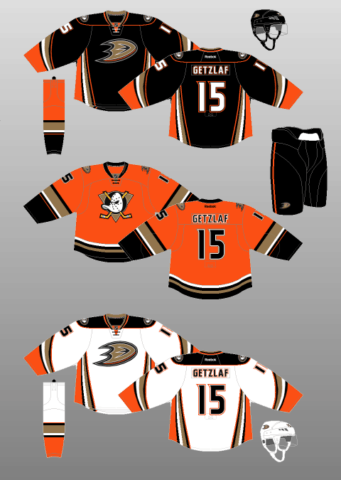 Which brings me to the Ducks’ short-lived orange alternate jersey, which lasted only two seasons (2015-16 and 2016-17). The original logo is back in the primary position, this time set upon a gold background to match Anaheim’s present-day colour palette. Meanwhile, the ducky “D” logo is up on the shoulders, serving admirably in its rightful place as a secondary crest. Combine that with an orange backdrop and traditional, horizontal striping, and it’s impossible not to acknowledge the Ducks, however briefly, wore one of the finest pieces of sweater craftsmanship in the history of the NHL. 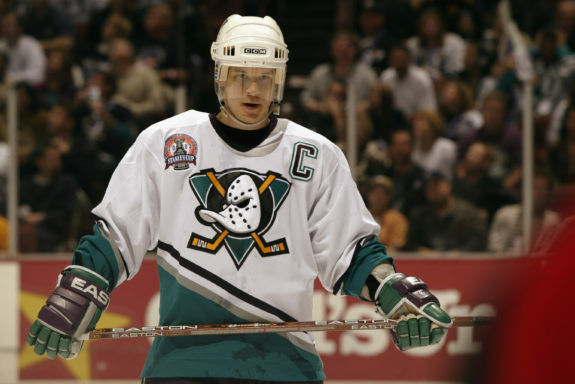 The Ducks’ alternate jersey is simply phenomenal and ranks very high on my list of all-time favourites. It doesn’t have the history of a Montreal or a Chicago but, judged on aesthetic appeal alone, how can you keep it out of the top ten? Come on, just look at it! It’s bright orange and flashy without being sickening. It’s complex without being busy. It’s new-age without being offensive to tradition. What’s not to like? Unfortunately, Adidas couldn’t figure out how to hockey in time for 2017-18, so the Ducks – and the entire NHL – went without third jerseys for an entire season. Thankfully, they returned for 2018-19, and the Ducks, blessed with a tap-in for a surefire hit…decided to go in a different direction. A bunch of them, actually. The original logo is back, which is a plus. So are the original colours and the original diagonal tail striping. Unfortunately, the overall execution is a confused, muddled mess. 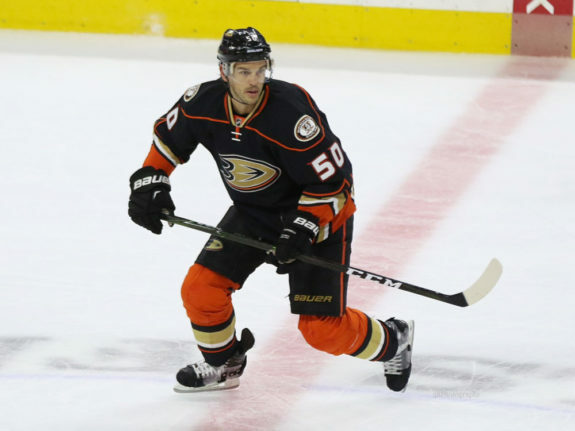 The black backdrop is not only tiresome, given that the Ducks’ current home jersey is black, but also ill-advised, as it completely obscures what little eggplant has been included in the design. The colour balance is further hampered by the throwback diagonal tail striping not being replicated on the sleeves. The chunky splash of jade on the tails really helps offset the bleak blackness of the sweater, but there just isn’t enough colour on the arms to make the black work on the rest of the sweater. For similar reasons, I’m not sure a silver backing for the logo was a great choice, either. As for other annoyances, the trimmed shoulder yoke has no basis in Ducks lore and is suspiciously similar to that of the Boston Bruins. The stripes aren’t all the same thickness – another break with history, with the thin silver stripe sticking out like a sore thumb. Mercifully, it sounds as though this kit will only be around for one season, celebrating Anaheim’s 25th anniversary as a franchise. We can only hope the Ducks come to their senses for 2019-20 and design something that actually works (or, you know, just bring back the orange one). The Ducks are a frustrating team, aesthetics-wise. They hit it out of the park with their first set of sweaters, and have certainly had some flashes of brilliance since. However, whenever everyone agrees on the quality of their on-ice look, the Ducks seem determined to dispense with all that goodwill in the pursuit of something almost unanimously despised. Interesting way to brand a team, that.